The timetable for the program can be found at the bottom of this page. CV: Prof. Alessandro Artale is an Associate Professor in the Faculty of Computer Science at the Free University of Bozen-Bolzano where he teaches graduate and undergraduate courses. His research interests include temporal logics, logics for knowledge representation, extentions of the ontology-based data access paradigm with a temporal dimension and reasoning over conceptual data models including their dynamic behaviour.He got a PhD in Computer Science from the University of Florence in 1994. He published more than 80 papers in international journals and conferences and as book chapters. He acted as both Chair and PC member in International Conferences, and as editor of both proceedings and journal’s special issues. His research has been funded by both European and National funds. Abstract: Ontologies of the geographic world are important to allow the sharing of geographic data among different communities of users. A geo-ontology provides a description of geographical entities, which can be conceptualised in two different views of the world. The field view considers spatial data to be a set of continuous distributions. The object view conceives the world as occupied by discrete, identifiable entities. Objects and fields are not merely located in space, they are tied intrinsically to space. However, to properly represent changes, it is also necessary to describe concepts that convey the dynamics of spatial phenomena. The notions of events and processes are useful to explicitly include the temporal dimension. The lectures present a general overview of the main trends in Geospatial Ontology, discussing the concepts of objects, fields and events for representation of geographical phenomena. The course also highlights the specific area of land use and land cover ontology, an area of considerable importance for geospatial ontology research. CV: Prof. Dr. Gilberto Câmara is a researcher in Geoinformatics, Spatial Database and Land Use Change at Brazil’s National Institute for Space Research, where he was General Director (2006-2012). He is internationally recognized for promoting free access for geospatial data and for setting up an efficient satellite monitoring of the Brazilian Amazon rainforest. From 2013-2015, he was Brazil Chair at the University of Münster. Gilberto has advised 50 graduate students and published 150 papers that have been cited more than 7500 times. He has received a Dr. Honoris Causa from the University of Muenster, a Chevalier (Knight) of the Ordre National du Mérite of France, the Global Citizen Award of the Global Spatial Data Infrastructure Association, and the Pecora Award from USGS and NASA. Abstract: We consider different views of the relationship between things which exist and things which happen. Do these form distinct categories (e.g., “continuants” vs “occurrents”)? If so, what sorts of relationships (e.g., one-way or mutual dependence) hold between them? If not, what kind of ontology is implied by this (e.g., some form of “four-dimensionalism”)? Amongst things which happen we consider subcategories such as processes vs events, and again ask if these form distinct categories, and if so how they are related. In particular, do they represent distinct objective properties in reality, or do they rather reflect different ways of conceptualising reality? These issues are explored against the background of some existing ontologies (e.g., BFO, DOLCE) and also used as the stimulus for developing some more or less radical alternatives. If there is time, we will then go on to look at the implications of these ideas for the analysis of causality and causal relations. CV: Antony Galton works at the University of Exeter, UK, where he holds the post of Reader in Knowledge Representation. His research interests are focused on Knowledge Representation and Ontology, with especial emphasis on spatial, temporal, and spatiotemporal phenomena. He is particularly interested in the interface between formal and philosophical approaches to these topics and believes that a fully-rounded account of the field should encompass both aspects. Abstract: This tutorial will offer a brief introduction to mereology, understood as a formal theory of the relations of part to whole and the relations of part to part within a whole. The focus will be on so-called classical mereology, according to which parthood is a partial ordering (a reflexive, transitive, antisymmetric relation) constrained by extensionality (no two composite wholes have the same proper parts) and closed under composition (any plurality of things compose a whole). Weaker theories obtained by relaxing some of these requirements will also be surveyed briefly, as will extensions obtained by enriching the language with intensional operators to represent tense and modality or with additional binary predicates to represent contact relations and further properties of mereologically structured entities (mereotopology). CV: Achille Varzi is professor of Philosophy at Columbia University, New York, where he has taught since 1995. His main research interests are in logic and metaphysics, with special emphasis on the application of formal methods to questions concerning the structure and persistence conditions of spatiotemporally extended entities. He is an editor of The Journal of Philosophy, a subject editor of the Stanford Encyclopedia of Philosophy, and an associate or advisory editor of The Monist, Synthese, Dialectica, The Review of Symbolic Logic, and several other journals. Abstract: In this course I will review the interaction between language and ontology from a theoretical and a practical point of view. I will show that on the theoretical side linguistic semantics, especially formal semantics and lexical semantics, has always been closely related to formal ontology, and for a good reason: semantics is about referring to what there is while ontology is about what there is. On the practical side, I will address the fertile relationship between ontology engineering and natural language processing through two major topics: building ontologies from text, which leverages on the fact that texts are among the strongest data available to acquire knowledge; and semantic resources, essential for many NLP tasks and information systems, which often mix up lexical and ontological knowledge and improve when these are disentangled. Finally, I will focus on systematic polysemy and complex categories, a phenomenon illustrating the language and ontology interplay in both its theoretical and engineering dimensions. CV: Laure Vieu is a French National Research Council (CNRS) senior researcher at Institut de Recherche en Informatique de Toulouse (IRIT). She has been working in formal ontology, formal semantics, lexical semantics, discourse semantics, and their interplay for over 25 years. She has coordinated a long-term interdisciplinary lab on interacting knowledge systems between (among others) IRIT and the Laboratory for Applied Ontology from the ISTC-CNR in Trento, Italy, where she was on secondment for 7 years. Abstract: Nowadays, nearly every aspect of our lives depends on organizations, since the day we are born until the day we die. It comes thus with no surprise the continuous quest for tools, methods and techniques that enable to deal with and manage them. Ontological modeling is one among these methodologies. But organizations are such complex and elusive objects that the possibility of providing meaningful models of them requires a deep and thorough analysis. This lecture is meant to provide a wide overview on some of the main notions that need to be analyzed prior to modeling organizations. These range from the foundations (e.g. collective intentionality, speech acts…), to the constituents (e.g. roles, groups…), to the theoretical perspectives which presuppose – or should presuppose – an understanding of them (e.g. socio-technical systems, cyber-physical systems…). CV: Roberta Ferrario is researcher at the Institute of Cognitive Sciences and Technologies of the CNR (National Research Council) in Trento (Italy). She has finished her PhD in Philosophy under the scope of a co-tutorship program between the Universities of Milan (Italy) and Strasbourg (France) in 2003. In 2004 she has spent an academic year at the Suppes Center for the Interdisciplinary Study of Science and Technology of Stanford University (USA). Back in Trento, she has worked on ontology of mind, of organizations and of services. Lately, her research interests have been on ontology of socio-technical systems and on the integration of ontological and computer vision approaches. She has been PI of the VisCoSo project (2012-2016), a three year “Research Unit” project grant of the Autonomous Province of Trento. She is member of the Executive Council of the International Association of Ontology and its Applications (IAOA), Associate Editor of the International journal Applied Ontology (IOS Press), PC Chair of the 9th International Conference on Formal Ontology in Information Systems (FOIS 2016) and she has been co-founder of series of workshops like CONTACT (Computer vision + ONTologies: Applied Cross-disciplinary Techniques) and FOMI (Formal Ontology Meets Industry). She’s author of a monograph, two edited books and more than 70 scientific articles and book chapters on social ontology, ontology of services, ontology of mental entities, philosophy of language. Abstract: There is a diversity of ontology languages in use, among them OWL, RDF, OBO, Common Logic, and F-logic. Related languages such as UML class diagrams, entity-relationship diagrams and object role modelling provide bridges from ontology modelling to applications, e.g. in software engineering and databases. Another diversity appears at the level of ontology modularity and relations among ontologies. There is ontology matching and alignment, module extraction, interpolation, ontologies linked by bridges, interpretation and refinement. The Distributed Ontology, Model and Specification Language (DOL) is an Object Management Group standard, which aims at providing a unified metalanguage for handling this diversity. In particular, DOL provides constructs for (1) “as-is” use of ontologies, models and specifications (OMS) formulated in a specific ontology, modelling or specification language, (2) OMS formalised in heterogeneous logics, (3) modular OMS, (4) mappings between OMS, and (5) networks of OMS. The presentation will cover the basics of DOL and provide examples for its application. CV: Fabian Neuhaus received his Ph.D. at Humboldt University in 2002, after which he worked on topics in formal ontology and applied ontology in the life sciences, first at the Institute for Formal Ontology and Medical Information Science at Saarland University and as part of the National Center for Biomedical Ontology at SUNY Buffalo. Between 2006 and 2013, he was a guest researcher at the National Institute of Standards and Technology. In 2013, he accepted a position at the Institute of Knowledge and Language Engineering at the University of Magdeburg, where he serves as the principal investigator for the EU project “Concept Invention Theory”. 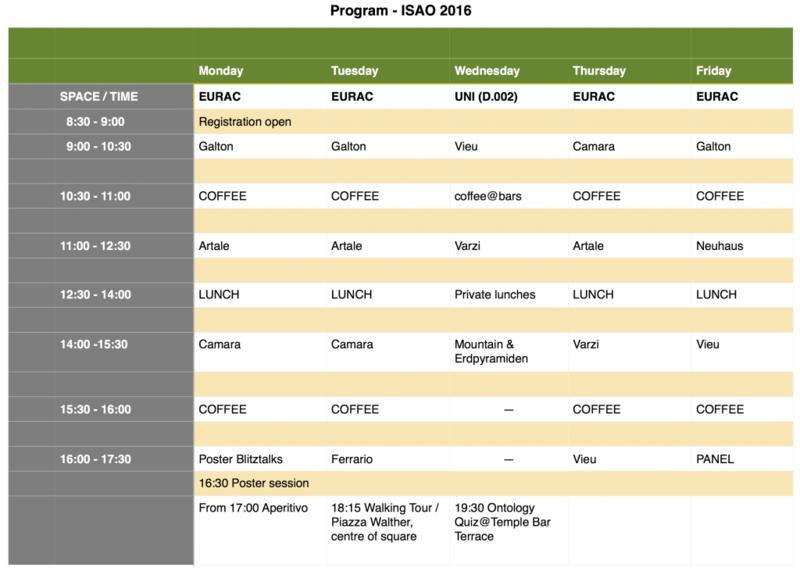 Since 2013, Fabian Neuhaus has been member of the Executive Council of the International Association for Ontology and its Applications (IAOA). Further, he is one of the principle contributors to both the revision of ISO Common Logic and the Object Management Group (OMG) Distributed Ontology, Model, and Specification Language (DOL). Currently, his main research interests are ontology languages and ontology evaluation. The poster session is scheduled for the first evening before and during the opening aperitivo. Participants are strongly encouraged to bring a poster, outlining their work and enabling other attendees to get an impression and directly connect to it. This shall give everyone a quick start into exchanging ideas, finding points of intersection and potential for collaborations, and simply getting an overview of all the things which are “out there in the wide world of ontology”. Posters can either describe a PhD project, other recent work, or simply give an outline of a new idea/sketch of a research program for the near future for which collaborators would be welcome. The pub quiz for budding ontologists! Compose a group of 2-5 participants and try to answer questions about ontology in a relaxing atmosphere. The question set consists of questions composed by the school’s lecturers on their topics and more.